Brisbane is the capital city of Queensland and is the third largest populated city in Australia after Sydney and Melbourne. Brisbane is a beautiful city and sits on the banks of the Brisbane river. The river stretches for 23 Km and winds through the city area. Brisbane is also known as the city of bridges. Once known as a "large country town" Brisbane has definitely now "grown up" with some of the highest buildings in Australia and home to some of the great sportspeople to represent the country. One of Brisbane's most popular spots with locals as well as visitors is South Bank. Once the location for Expo '88 the area was later converted into Southbank parklands and the cultural centres of Brisbane including the Entertainment Centre, The Art Gallery and the Museum. 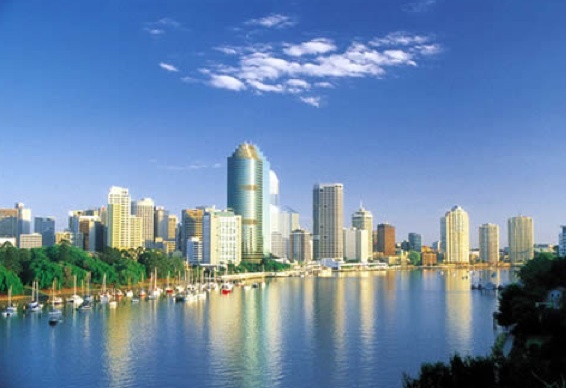 Located across the river from the city in South Brisbane Southbank is a major attraction. A huge man made beach, with their own life guards as well as cafes, cinemas, markets, restaurants, shops and regular live entertainment shows make up this unique complex. Access to South Bank is easy with the many City Cat ferries that travel on a regular basis along the river from many points including the CBD. Southbank is so popular with the locals because it is a safe clean place for children to swim, play and enjoy the park like environment. A short drive from the CBD and you are high above the city looking down on the winding Brisbane river and the city skyscrapers. There is a cafe and a restaurant at Mt Cootha and its a lovely place to be on a clear day. On the way up to Mt Cootha you will pass the Brisbane Planetarium. If the skies interest you its worth a visit. There is also some really nice parklands on the way if you fancy a BBQ or picnic in the park. Other places of interest are Chinatown or Fortitude Valley. Here there is a busy night life spot which attracts the younger generation after dark. Along the winding Brisbane River there are many attractive spots. In the heart of the CBD on Eagle Street you will find some very good restaurants overlooking the river. This is a million dollar view as you enjoy your lunch or dinner. It is definitely recommended that you hop onboard one of the City Cats which is the fast ferries that travel along the river. This will not only give you a view of the river but you can see a lot of the Brisbane historical buildings and even spots you may like to get off to explore. The city cats will take you to Southbank, the Museum, Exhibition Centre and also the Powerhouse building further down the river that should be visited. Here you will find exhibitions, restaurants, historical buildings and a mixture of other events that change regularly. You may even be lucky enough to catch one of the Cruise ships that are docked in Hamilton. It is only in recent years that the Brisbane river has been able to accommodate Cruise ships of this size. Quaint, quiet and a little hidden, The Burrow is an eatery which has perfectly tapped into so many of the hipster trends sweeping through our fair city. It ticks all the boxes: the atmosphere is chilled out and vibrant at the same time, the décor is the usual blend of rustic and kitschy, and the waitstaff are far trendier than you. But what about the food? The Burrow is home to a well-respected selection of wood-fired pizzas with such intriguing names as ‘Fun Guy’, ‘Mr Potato Head’ and ‘Hillbilly Chilli’. These pizzas are about flavour, fresh ingredients and intriguing topping choices, and they do them well. However, be warned: the full pizza range is only available for dinner, and if you’re not entirely fond of pizza, the there aren’t many other options on offer. In terms of drinks, forget your everyday pub beers – this place is all about the less ‘mainstream’ options. You’ll be choosing from a range of semi-obscure ales and ciders, which is, in all fairness, something to be expected from any West End venue trying to nab your attention. Watch out Max Brenner, there’s a new player in town. This suave Spanish hustler is all too eager to steal away the hearts and taste buds of Brisbane’s chocolate lovers. Fairly fresh to our little town, San Churro is already sending hearts racing and sugar levels soaring. Those of you who have been down to either Melbourne or Sydney in the past few years will recognise both the name and the reputation. With a strong focus on the always classic ‘churro’ (essentially an unfurled donut), this is a place that embraces its Spanish theming. There is a hint of spice in a number of the menu items, but nothing overwhelming – just enough to set your taste buds alight. And much like archrival Max Brenner, there is also a cavalcade of coffees, shakes and other drinkable delights on offer. Atmosphere-wise, there isn’t a great deal to distinguish this place from Brenner, but it is still a great place to escape the winter chill with family, friends or a date. In the long run, San Churro will likely hold our attention – at least until the next stranger with candy comes along. Already bubbling away beneath the surface of the city for a while now, Brew is starting to become the go-to place for a casual chat and a good coffee in the CBD. Tucked away in an alleyway just off the Queen St Mall, this humble hole in the wall is the quintessential paint-by-numbers example of Brisbane’s experiment with Melbourne laneway culture. Out front, alongside conveniently placed fake grass and lawn furniture, you have your counter for anyone to grab their coffee and go. But out back is where all the action’s at – the mixture of full tables, couches and little enclaves allow for anything from serious meetings to quiet rendezvous. As for the actual coffee, we might have a contender for the best bean in Brisbane. Its choice of subtle and strong is already earning it a reputation. In terms of nibbles, they cater to the usual café crowd with a selection of breakfast items and sensational sandwiches. If you are staying in Brisbane you must take the time to visit the Gold Coast and the Sunshine Coast which are about a one hour drive south or north. The beaches are some of the best in the world. Send us your story, review or story about a holiday destination or experience in Brisbane Australia.